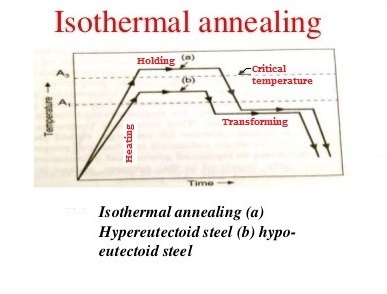 It is a type of full annealing in which the steel first is cooled to the temperature at which it is desired to have transformation occurs, at a rate sufficiently rapid to prevent any structural change above that temperature. The steel then is held at the selected temperature for the time necessary to complete such transformation. Thus it possible, with this process to obtain a more uniform micro-structure that could be expected by continuous cooling. However, since it is necessary to drop the temperature rapidly to prevent any transformation above the desired temperature, there are definite limitations as to the mass that can be co-treated. It is applicable, therefore, only to small sections and would be suitable for large bars or large load in batch type furnace since in would be impossible to cool them at a rate sufficiently rapid to prevent some transformation. It is suitable only for small components. 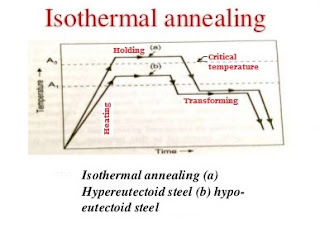 Heavy components cannot be subjected to this treatment because it is not possible to cool them rapidly and uniformly to the holding temperature at which transformation occurs.